Declan Costello’s Just Society: A Fine Gael Symbol of Progress or of Division? Declan Costello died on 6 June 2011. Profiles of the former Fine Gael TD following his death made continuous references to his Just Society document, published as the Fine Gael manifesto for the 1965 general election. In his tribute, Taoiseach and Fine Gael leader Enda Kenny described the document as ‘an initiative that helped to modernise the party and broaden its appeal’. Various media sources echoed the opinion that the Just Society had made an important impact. Hugh O’Connell’s assessment for TheJournal.ie claimed that the document ‘would define the party for some 20 years’, while Deaglán de Bréadún writing in The Irish Times described Towards a Just Society as Costello’s ‘monument’. From these, and other tributes, it is clear that many perceive the Just Society as an important document in Irish political history. It came to be identified by Fine Gael as a key moment in the party’s history, and when their old website contained a history feature, the Just Society era was given its own, albeit brief, section. The praise that surrounded Costello’s initiative in the tributes paid after his death masks the fact, however, that Fine Gael was not united on the proposals in the 1960s, that the policy had faded away as a priority by the 1970s, and that, while it may well be remembered by members, it was not a consideration in policy formulation over the two decades that followed its introduction. It is reasonable to argue that the Just Society became an inspiring slogan, a useful reference. Until the death of its author, the Just Society was largely un-discussed, and there has been little critical analysis of its content and the events surrounding its formulation. A notable exception is the One-to-One interview with Costello conducted by David McCullagh for RTÉ television in 2009, a large portion of which focussed on the policy document. That interview played an important role in highlighting the difficulties that Costello faced in having his proposals accepted. Aware that the views he had held for some time were not ‘shared by the majority of my colleagues on the front bench’, Costello breached protocol and sent a circular to all members of the parliamentary party on 27 April 1964. In it he explained how he wanted to gauge the reception of the party in general, asking for a formal vote on his proposals if necessary. He appealed to his colleagues on two grounds: firstly, that his policies were the ‘right ones for the country’ and secondly, that they offered Fine Gael an opportunity to define its role in Irish politics. Costello argued that, if adopted as official policy, his proposals would have a dramatically favourable effect on the party’s fortunes. The document was the subject of discussion at four meetings of the parliamentary party, beginning on 29 April. Costello proposed that the policy be based upon eight principles: economic planning (rather than the government’s policy of programming), which would include the private, as well as public, sector; a ministry for economic affairs; government control of the banks’ credit policies; investment in industry; and price control. He also proposed to reverse the government’s policy of reducing social capital investment and the preference for indirect as against direct taxation. The initial reaction of the parliamentary party was one of wariness as the proposal represented such a break with the past. There was, however, only one voice of resolute opposition at that stage – that of Maurice Dockrell, who had first been elected to the Dáil in 1943. Although he did not voice his opposition, there can be little doubt as to where Gerard Sweetman stood. In his opinion, the country needed ‘alternative governments rather than alternative policies’. By the time of the next meeting on 5 May, deputies had had an opportunity to consider and discuss Costello’s proposals among themselves. The nature of the contributions varied between those of Seán Collins, deputy for Cork South-West, who favoured new methods and of Louth’s Paddy Donegan, who preferred the maintenance of Fine Gael’s traditional role as a private enterprise party. Patrick McGilligan’s was the dominant voice at that second meeting, and his intervention was crucial to the success of Costello’s document. McGilligan had entered politics in 1923 when Cumann na nGaedheal (Fine Gael’s parent party) was in power and was invited to join the cabinet only three months later, proving to be the most innovative minister in that government. He was one of the most respected members of the party, was deemed one of the three most influential people in office during Fine Gael’s last term in office (1954-7) and was considered to have ‘the power of persuasion’ over Dillon. Indeed, the party leader – though not necessarily agreeing with his argument – considered McGilligan’s intervention to have been of ‘priceless value’. McGilligan argued in favour of making full employment and an increase in the standard of living the party’s objectives, and – echoing Costello’s own concerns – he asked his colleagues to consider the policy upon which they would have based their programme for government had they formed an administration after the 1961 election. Before the parliamentary party reassembled, delegates gathered for the annual Ard Fheis, occurring on the weekend of 19 and 20 May. By then the media was fully aware of the discussions due to an accidental leak by Paddy Harte, a junior member of the party and close attention was paid for indications of how the debate was unfolding. The Just Society proposal did not officially feature on the agenda for the Ard Fheis. To have introduced a largely un-discussed document would have been inappropriate, particularly since the parliamentary party had not yet voted on the matter. Despite this, Costello’s philosophy was represented. Of the 76 motions on the agenda, it was observed that ‘almost all of them could be described as socially radical’. There were also indirect references to the behind-the-scenes discussion, particularly evident in James Dillon’s un-scripted remarks. Although he did not refer directly to Costello’s proposal, he spoke of how Fine Gael would always encourage free discussion, but then revealed his distrust when he remarked that ‘young men could dream dreams and have visions, but there were no short cuts’. In his leader’s address he ‘denigrated young men in a hurry’, while praising his ally Gerard Sweetman, leaving observers in little doubt as to where he stood. As the battle lines were being drawn, Liam Cosgrave was surprisingly identified as a supporter of Costello. Despite his conservatism, he had taken a pragmatic approach and recognised in the proposal an opportunity to challenge the dominance of Fianna Fáil. As he put it to those assembled at the Ard Fheis, ‘if we are content merely to be critics of Fianna Fáil we will accept a negative role which may be a self-satisfying ordinance but is, in fact, frustrating and unrewarding’. Although not making explicit reference to the document, he had also referred to the necessity of keeping ‘slightly to the left’. Rather than this being an indication that he favoured the party’s new direction, it could be interpreted as a strategic position, influenced by the possibility of collaboration with Labour. Cosgrave confirmed his belief that the party should ‘appear to be progressive and to be moving with the times’ at the next meeting of the parliamentary party on 20 May. His Ard Fheis speech, taken with earlier McGilligan’s intervention on 5 May, is likely to have been a pivotal factor in the policy’s acceptance. Thomas O’Higgins, another senior figure, also announced his ‘100% support’. But despite the admissions of the Fine Gael heavyweights, some lingering doubts remained. The final discussion took place on 26 May. Dillon made reference to talks over the weekend that had involved Cosgrave, Michael O’Higgins, Costello, Sweetman and Hayes. A compromise document was produced, although it is likely that its terms were reached between Costello and Sweetman alone. The outcome was a revised nine-point document, put before the parliamentary party the following day. There were no substantial changes from the first three points outlined in Costello’s original document, and the criticism of the government’s policy of cuts in social capital investment remained unchanged. In place of the suggestion that the commercial banks be brought under government control, it was outlined that ‘the credit policies of the commercial banks must, through the medium of the central bank, be in accordance with the government policy as is provided in the other democratic countries’. ‘Where desirable in the public interest’ was added to the point which dealt with direct government investment in industry, while the taxation policy was modified to address the poorer sections of the community. Price control was omitted. A ninth point – relating to improving the standard of living in the agricultural sector to equate non-agricultural occupations – was introduced. It was an important addition: an earlier article in The Kerryman had rightly claimed that Costello ‘had no message for agriculture’. 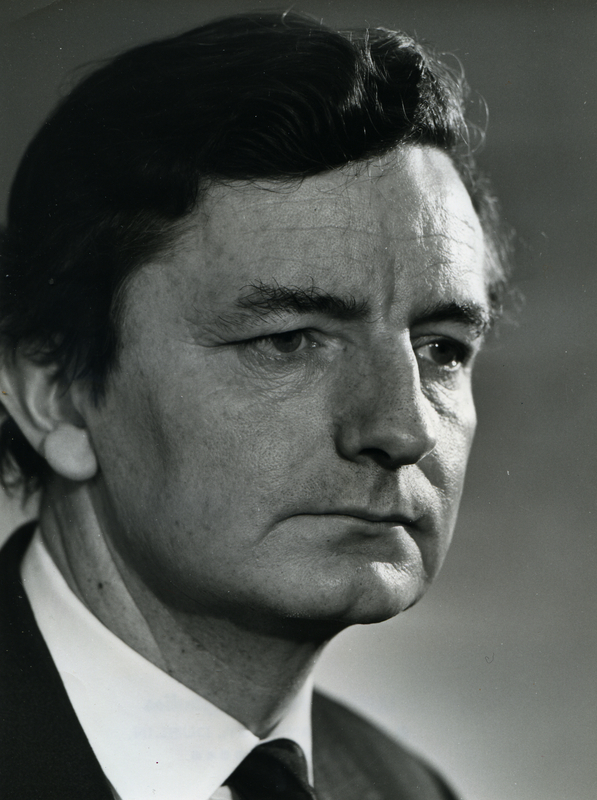 The party’s policy committee, chaired by Liam Cosgrave, was to provide the forum for the process of developing the nine-point policy into a comprehensive programme. Cosgrave described his involvement as that of filling the role of ‘chairman until agreement was reached on an agreed document’; he never participated in the actual drafting. The drafting was conducted mostly at Costello’s home, and although assistance was available during the process, Costello authored the majority of what was produced. The 1965 general election was the first real test of the Just Society: an opportunity for the party to step out from Fianna Fáil’s shadow and to convince the electorate that it had created a document, not only reflective of a changing Ireland, but one that also addressed those areas that had not benefited from Seán Lemass’s rising tide. But the document’s reception by certain members of the Fine Gael parliamentary party – in particular, the leadership – did not bode well for its prospects among the party’s traditional supporters. Furthermore, although the parliamentary party had unanimously endorsed sending Costello’s proposal to the policy committee, the decision was not comparable to unanimously supporting the policy itself. And even though the document formed the foundation of the 1965 election manifesto, as the campaign clearly showed, Fine Gael was not yet ready to fully embrace change. The document was finalised only after the election was announced. Although there had been unease among certain elements of the party, no alternative policies had emerged during the course of the year. The Just Society, therefore, became official Fine Gael policy for the election almost by default. As a campaign tool, it would prove ineffective. Towards a Just Society was a statement of the problems in Ireland at the time and, though Costello offered some solutions, they were not the type of appealing promises that would be seen in the type of documents produced after Fianna Fáil’s give-away manifesto of 1977. Essentially, what Fine Gael published was a policy document, not an election manifesto in the accepted sense. It made little impact on the voters. With limited time to publicise the document, hampered also by restricted circulation, voters never had the opportunity to familiarise themselves with the content. At national level, the impact was further undermined by the leadership’s lacklustre endorsement, while, at constituency level, candidates opted instead to focus on local issues. Towards a Just Society was officially unveiled on 18 March. The press launch was a disaster. To the assembled journalists party leader James Dillon declared: ‘we shall rely on private enterprise. We are a private enterprise party’. In two short sentences he appeared to contradict the content of a manifesto that advocated greater state involvement. 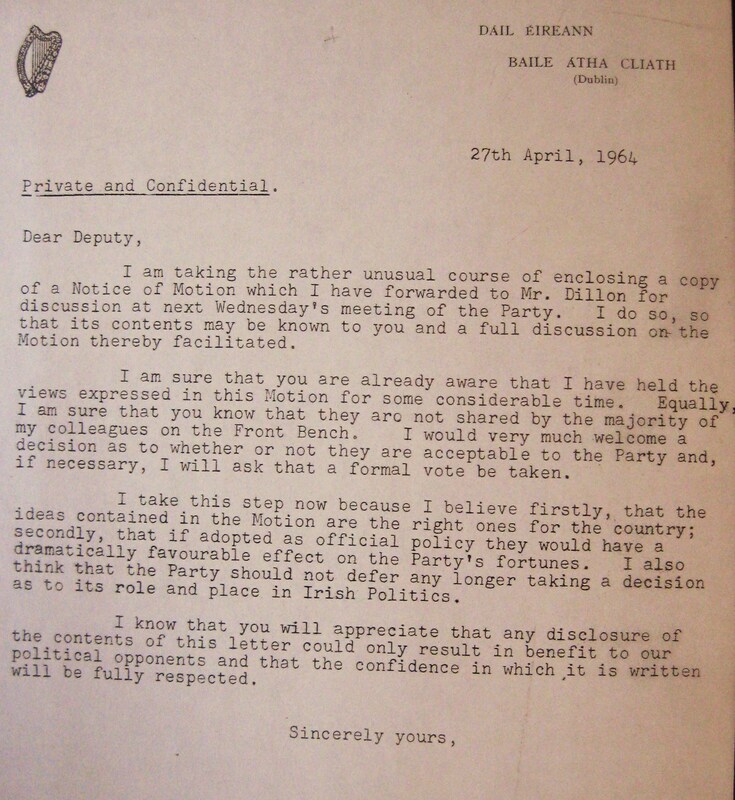 Dillon and Costello had categorically denied on the eve of the 1964 Ard Fheis that there was a serious breach within the party ranks, but the terms ‘crisis’ and ‘rift’ had crept into various newspaper headlines. Dillon’s speech gave further credence to the widely spread rumours that Fine Gael was divided on the party’s new direction. Naturally, Fianna Fáil made much of this. A handbill addressed to the voters of Dublin South-East, for example, described Fine Gael as a ‘house divided against itself’ and asked ‘how then can it aspire to govern the nation?’ In its post-election analysis, headquarters acknowledged that reports of splits militated against the party, but described the dissension as ‘imaginary’ and the creation of political correspondents. Though Fine Gael had always been a coalition of interests, the media was correct to be sceptical. For many politicians, support had been given based on the absence of any alternative. Fine Gael’s true commitment to the Just Society would be tested in the aftermath of the general election. The party had adopted the concept in 1965 because the document was already under preparation and there was no alternative on which to fight the campaign. As discussed in more detail in the next chapter, there were some signs of activity. For some of the more conservative elements, though, there was a sense that adopting the policy was sufficient and that no further discussion was necessary. Fine Gael did not completely shelve the concept. Rather it conducted its campaign for the 1969 general election under the banner of Winning Through to a Just Society. However, there was a sense of disillusion among Declan Costello’s supporters that the party had not done more to develop the ideas laid out in 1965. By the time of the next election, Costello had retired from politics. Although he reversed that decision and contested the 1973 general election, becoming attorney general in the newly formed National Coalition of Fine Gael and Labour, as one party activist put it, ‘We were the party of the Just Society … but it was a long way behind us by then’. The Just Society might be held today as a symbol of the party’s progress by Fine Gael members and supporters, but in the 1960s, it was very much a symbol of internal division. The reasons why Costello formulated his proposals when he did, the internal debate and impact on Fine Gael, and the document’s legacy are more fully explored in my forthcoming book, A Just Society for Ireland? 1964-87, which will be published by Palgrave Macmillan in November 2013. In the meantime, if you’re interested in hearing more about the content of Towards a Just Society, you can download my podcast for HistoryHub.ie from iTunes here.